Circuit schematic like in Figure 1. above is Circuit Schematic Low Power Inverter 12VDC to 230VAC using CD4047 and Power MOSFET IRFZ44. 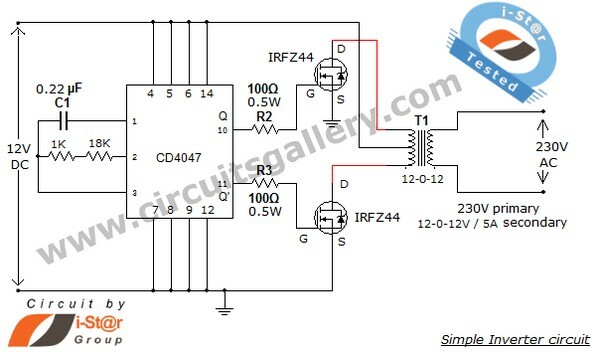 According Circuitgallery site describe that this simple low power dc to ac inverter (dc to ac converter) circuit converts 12V DC to 230V or 110V AC. By doing simple modification you can also convert 6V DC to 230V AC or 110V AC. It can be used as inverters for home needs to enable light loads (electric bulb, CFL, etc) at the time of electricity failure. You can construct this circuit of simple inverter at a cheap rate with locally available components. Use a 12V rechargeable battery and battery charging circuit for this dc to ac inverter. We have already posted the circuit for battery charger. Read more here.